Bone Binder was created because Mister Tea had a class with a guy who had a really bad accident. There were broken bones, there were liver issues from an infection, and there was a complication due to antibiotics used in the hospital. Desert Sage Natural came up in conversation, and he asked if we had any teas that could help. One of the teas we created for his situation was Bone Binder. 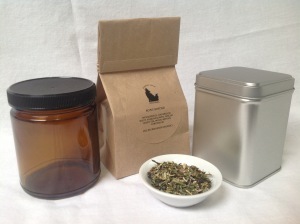 It was blended to assist with the healing of broken bones, but it is a good general bone health tea, as well. 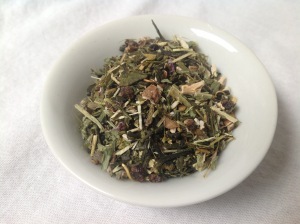 It contains Wood Betony and Cardamom for bone strengthening and healing, Dandelion Root for nutritive support and cleansing, Green Tea for antioxidants and as a catalyst, and Passionflower for calm and to help with pain. This entry was posted in Medicinal Teas and tagged Bone Health, Organic Cardamom, Organic Dandelion Root, Organic Green Tea, Organic Herbal Tea, Organic Medicinal Tea, Organic Passionflower, Organic Tea, Wood Betony by DesertSage. Bookmark the permalink. Now if I can just get my husband to drink it! !